Ahhh Lush! How do you do it? I literally cannot walk past one of your stores without your charming scents and rainbow themed aesthetics dragging me inside for a closer look sniff. I popped into Lush Middlesbrough on Friday and had a good old perve on their new Christmas goodies. Yes, I wanted it all but I managed to resist and come away with just 3 items. I'd been wanting to get my hands on some Lush skincare for a while, and I kept hearing a lot of good things about the Ultrabland Cleanser (£11.95 - 100g) so I decided to give that a go. I always tend to go for balmy, oily type cleansers that will remove my makeup whilst leaving my skin soft and supple, so this one looks right up my street. Look out for a full review after I've given it a good trial. 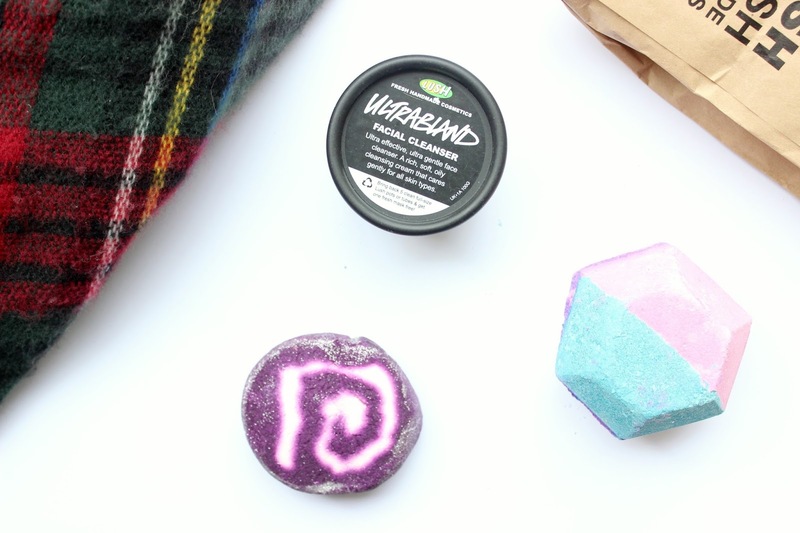 Obviously I had to get a couple of bath-related products, so I went for The Experimenter Bath Bomb (£3.95), which I think was brought out in the Summer when they opened their new flagship on Oxford Street, and the Bah Humbug Bubble Bar (£3.65), which of course is new for Christmas. Really looking forward to using these 3. Next on my list: Lord of Misrule Bath Bomb & Sparkly Pumpkin Bubble Bar!